Perhaps the biggest story of the last week is the story that you probably missed. It's a climate change story. I think I heard something about it on NPR, but a lot of news oxygen was used up by the RNC and the Hurricane. 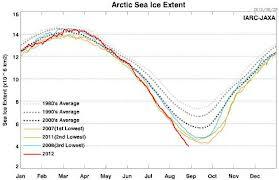 Arctic sea ice extent fell to 4.10 million square kilometers (1.58 million square miles) on August 26, 2012. This was 70,000 square kilometers (27,000 square miles) below the September 18, 2007 daily extent of 4.17 million square kilometers (1.61 million square miles). Including this year, the six lowest ice extents in the satellite record have occurred in the last six years (2007 to 2012). 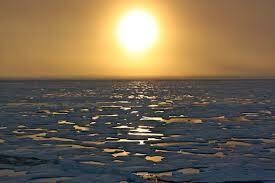 It’s clear that Arctic sea ice is now shriveling more quickly each year. And scientists say the melt has been driven by both global warming and other pollutants that humans have put into the atmosphere. So why does the disappearing sea ice actually matter? Partly it’s a sign of how quickly we’re heating the planet. Yet the vanishing sea ice can also have its own side effects, from warming up the Arctic further to unlocking once-frozen areas of the north for oil and gas exploration." And yet, within days of the announcement of this science fact, the new leader of the GOP says derisively that "President Obama has promised to slow the rise of the oceans and to heal the planet". That kind of disconnect from reality is not the kind of help my family needs. It's said that people who believe in infinite growth in a finite world are either insane or economists. Yet, we all embrace that meme...and a very dangerous meme it is. If we, as sailors on our earthship wish to continue our DNA in this universe, we will need to throw out almost everything we believe. We must purge our operating systems of the belief systems we hold in our biocomputers. Memes of separation will not do. Soon, we will reach a tipping point in consciousness. We will take the trillion dollars we spend defending ourselves from our little enemies, and we will apply it to the big enemies the world currently faces. And its not terrorism, or some nation, or some idea about who god is. It is the greed of the corporate world as embodied in our fossil fuel giants, our banking giants, and all those other disciples of capital who have stolen our democracy in the name of freedom and with the tool of fear. We will have to not just stop burning carbon to save ourselves, we will have to change our view of ourselves, and our mission in the universe. Within the next decade, we will have to mine our atmosphere of the carbon we put into our most precious resource, our biosphere. The future will change us.